The 2019 winter prediction report mentioned here on the Greenest Insulation Blog has proven to be very accurate. A cold and wet winter continues across most of the U.S. One aspect of winter beauty that some homeowners may be seeing are those classic icicles hanging from the roof. 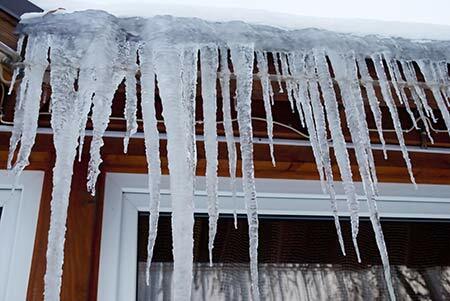 Icicles are formed on the drip line of a roof when snow higher up melts and the resulting water freezes as it falls off the roof. In some cases this is caused by the sun. But more frequently this is a sign of poor attic insulation. Heat rises in a home and can pass through to the attic where there are gaps in the insulation (such as with fiberglass batts) or unsealed leaks around the insulation. That air heats the underside of the roof causing the snow to melt even when air temperatures are below freezing. Ice dams can also form in some houses with this condition causing water to build up and seep under the shingles. This can lead to roof damage. Homeowners seeing these icicles may also see uneven snow patches on the roof, which are another indicator of heat on the underside of the roof. Either way, the culprit is most often poor or under insulation in the attic. The good news is the fix is usually very simple. Seal the attic area and add or upgrade the insulation. Homes with icicles cost the owner all winter with higher heating expenses. The investment in upgrading insulation is one of the best energy efficiency upgrades an owner can make and the return on investment is immediate. CIMA recommends have a professional energy audit and the insulation done by a qualified insulation contractor. Find contractor referrals here. This entry was posted in DIY & Insulation Tips, Energy Savings, News & Information. Bookmark the permalink.